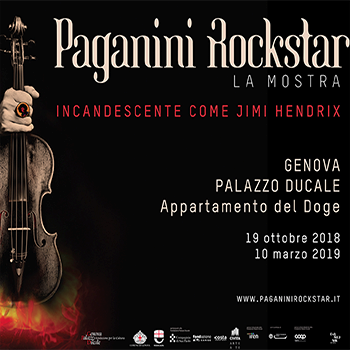 Paganini Rockstar is the exhibition dedicated to Niccolò Paganini by Palazzo Ducale and Genoa to tell, with a contemporary narration, the figure of the greatest violinist of the Nineteenth Century. The exhibition, set up in the Appartamento del Doge from 19th October 2018 to 10th March 2019 renew the genius, the dissipation and the mystery of the legendary musician, who, through the fame, the excesses and the “Capricci”, invented the star behaviour. The thematic path of the exhibition, curated by Roberto Grisley, Raffaele Mellace and Ivano Fossati, immerses the visitors in the history of the celebrity, thanks to the representative objects, scenery props and flats, audio and video projections. The Archivio Storico Ricordi contributes to the exhibition with the loan of the autograph scores of Capriccio n.5, n.24, n.1 and n.13 by Niccolò Paganini, and two original documents of Animi Motus, composition of 1994 for string quartet and electronics by Azio Corghi, in which is inserted the Motus Perpetuo by Paganini.